The new Mountfied 1543H-SD is a new version of this popular ride on mower for 2016. 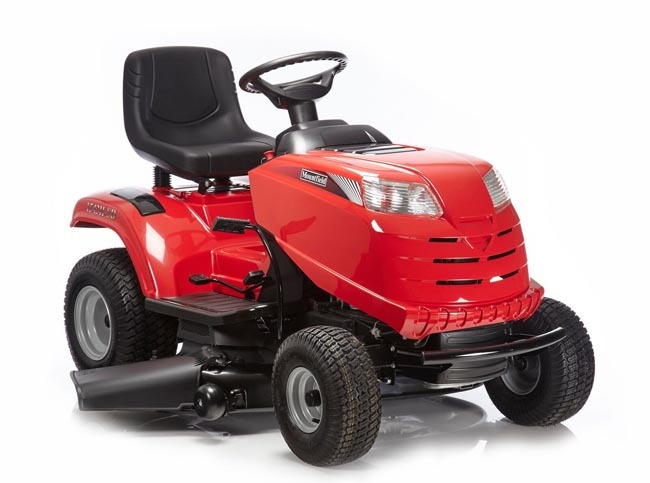 This new model, a development of the best value dedicated dual function mulching/side discharge ride on mower available, has a 108cm/43.2 inch cutting width deck suitable for areas up to 2/2.5 acres. The Mountfield 1543H-SD offers the perfect solution where collection of grass clippings is not required. In tall grass conditions the side discharge cutting deck will neatly cut and spread the grass so that it can be left to wilt naturally. For lawns that are being mown on a more regular basis, the mulching function cuts then recuts the grass into small particles that will disappear into the turf, returning valuable nutrients into the soil. The 1543H-SD is powered by a 452cc Mountfield engine and has foot controlled hydrostatic transmission giving variable forward and reverse speeds as well as instantaneous changes between forward and reverse drive making it a highly manoeuvrable machine. Cutting Width is 108cm/43.2 inches. Cutting heights are easy to adjust from 25mm to 80mm with seven settings. * Delivery of the Mountfield 1543H-SD is included only to addresses in Norfolk and the Waveney Valley area of Suffolk. One of our own service engineers will deliver and install this machine. We provide full after sales support for all Mountfield products we sell from our branches at Horstead, Norwich and Toftwood, Dereham.